If you just started to use Dux-Soup, we recommend starting with the following options. Depending on the LinkedIn you have, there are a few points that need to be mentioned. Here we are going to focus on the Robot Speed and Daily Limits. Profile Visits — this shows you how many profiles the robot will visit per day. When the robot is visiting, it actually clicks and goes to the profile as you would do manually. If you have a small circle of connections (150 as per our example), let’s leave the default setting and visit 100 profiles a day. Connection requests — during profile visits, you can also send a connection request message together with your invite. 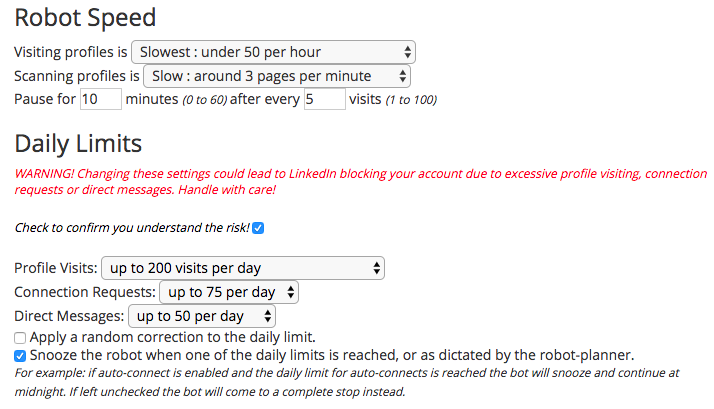 When it comes to connection requests, we recommend sending them to no more than to 3–5% of your total LinkedIn connections. In this case, that would be around 75 connection requests per day. We advise to start with the minimum and send no more than 25 requests per day. Keep the suggested settings for two weeks and monitor your account. Then, after two weeks you can slightly increase the number of connection requests to 30 per day and keep these settings for another week. This is how you would grow your daily limits and ensure the account is safe and healthy. Let’s follow the same procedure as we did with the previous example and head over to Options > Throttling tab. Again, you will see two main features — the Robot Speed and Daily Limits. Even if you have a Sales Navigator account, it’s better to keep the speed slow for the first few weeks. We are just getting started and picking up the speed as you visit profiles and get new connections will look more natural to LinkedIn. Don’t forget to make pauses between the visits, it’s equally as important. Profile visits — as a Sales Navigator user, you can visit up to 500 profiles a day. That’s the default setting on Dux-Soup which means that if you don’t touch the settings at let Dux-Soup run, it will visit 500 profiles per day. However, as these are your first days with Dux-Soup, we recommend going with fewer profile visits and starting with 200 visits a day. Connection requests — When it comes to connection requests, we recommend sending them to no more than to 3–5% of your total LinkedIn connections. In this case, that would be around 75 connection requests per day.